1938 advertisement for Universal Studios‘ line of serials. From 1914 to the late 1950s (due in part to the rise of television), audiences flocked to their neighborhood movie theater every week to catch the latest filmed serial chapter of their favorite heroes in action. Most of the vintage motion picture serial series were adapted from comic books, newspaper comic strips, western dramatizations, mystery/suspense tales and science fiction novels. 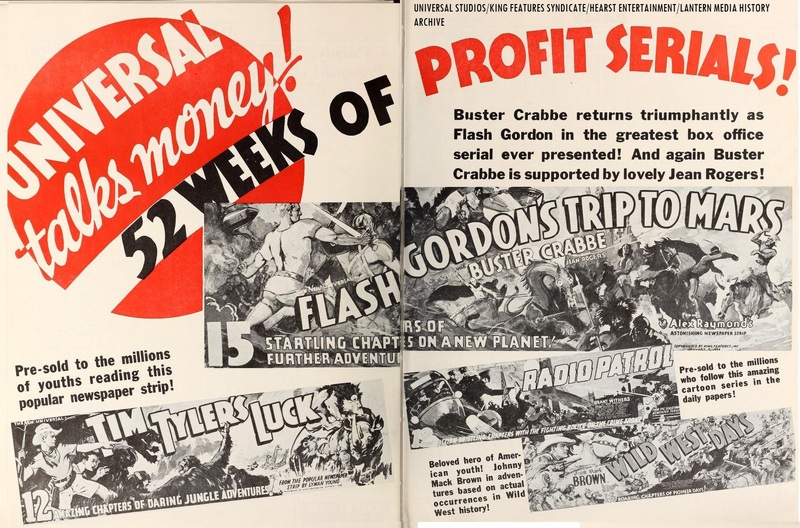 Some of the weekly action/adventure serials were sometimes billed by cinema exhibitors as “kiddie matinees” (for weekend showings). 1936 ad for Columbia Pictures‘ line of serials. After the decline of the weekly cinema serial in the late 1950s (Columbia and Republic were the last motion picture studios to specialize in the serial format alongside theatrical feature films), some of the older serials would be syndicated to television. Several motion picture serializations would be re-discovered, due in part to the growth of home and entertainment cable television. “Mystery Science Theater 3000” hilariously mocked the vintage Republic “Radar Men From The Moon” serials early in the show’s “Comedy Central” era. AMC (then-known as American Movie Classics) would show several vintage motion picture serial anthologies in the mid-1990s. Turner Classic Movies has continued to show several vintage movie serials on Saturday morning to emulate the old Saturday morning “matinee” theatrical film showcase. 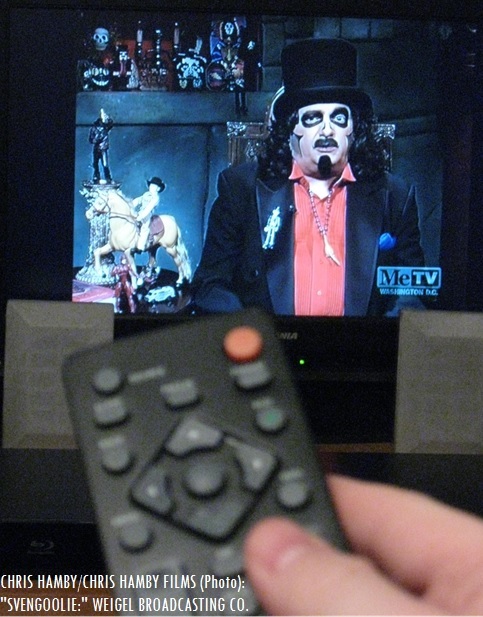 Legendary Chicago-based horror film host Svengoolie (portrayed by Rich Koz) has mocked the classic Buster Crabbe “Flash Gordon” serials in “Svensurround” on Me-TV (in case the coveted Universal horror/sci-fi feature has a short run time). In commemoration of the upcoming release of “Batman v Superman: Dawn of Justice,” TCM will showcase several vintage motion picture serial series based off of several popular comic book and newspaper periodical strips. The festival will begin with the first two chapters of Columbia Pictures’ “Batman” serial from 1943 at 8 p.m. Eastern. After that, the network will present the first two chapters of the 1949 serialization sequel, “Batman and Robin” at 9 p.m. Eastern. An interesting experience for fans of comic books and classic cinema everywhere (or if you want to “riff along,” a la “MST3K,” “RiffTrax” and “Svensurround.”). Questions/Comments about vintage movie serials? Drop a line at the comments section! An overlooked film featuring one of cinema’s iconic comedy duo teams will be shown this upcoming weekend. The iconic Chicago-based horror host will show a comedy of ghostly proportions on Me-TV, as he will present the 1946 farce “The Time of Their Lives.” The film features Bud Abbott, Lou Costello, and Marjorie Reynolds. “Svengoolie” (portrayed by Rich Koz). This film is a little different than the typical Abbott and Costello comedy. In “The Time of Their Lives,” the comedic duo portrays individual characters, instead of their usual comedic skit roles as pals. Set in the mid-1940s, two cursed Revolutionary War-era ghosts, Horatio Prim (Costello) and Melody Allen (Reynolds) haunts the Danbury Manor estate. Psychologist Ralph Greenway (Costello), a descendant of Cuthbert Greenway (the man that convicted Horatio, who was wrongfully sentenced to death for treason 160+years before) is tormented and fooled by the ghosts. A perfect blend of chaos, hilarity and unique visual effects are showcased in this film. The film did not do well during its general release in 1946, due in part to Abbott and Costello not performing their standard routine, which they returned to in “Buck Privates Come Home.” In later years, the film has been rediscovered and appreciated by fans of vintage comedic cinema. “The Time of Their Lives,” along with Svengoolie’s skits, is a perfect way to kick off the weekend. Me-TV Network (in the Washington, D.C./Frederick, Maryland area on WJLA-TV 7.2/Comcast 204 and in the Baltimore area on WBAL-TV 11.2/Comcast 208). A Brief “Spring Break” Greeting: To all fellow friends of the Matinee, enjoy your Spring Break (despite recent weather updates predicting that a Nor’easter will be in store in the area for the weekend). Do something exciting, worthwhile and memorable over the break! Questions? Comments? Drop a line in the comments section! In honor of St. Patrick’s Day, here’s a trip down MST3K “memory lane.” Host Michael J. Nelson, along with the wisecracking robot companions Tom Servo and Crow T. Robot are riffing Ireland’s 1961 answer to “Godzilla,” “Gorgo.” Eugène Lourié’s film featured Bill Travers and William Sylvester. This was episode #909 of the series. It originally aired on the Sci-Fi Channel (before it was renamed as “SyFy”) on Jul. 18, 1998. Noted film historian and critic Leonard Maltin made a special cameo appearance on the show. According to “Satellite News,” the episode only aired twice, due to rights issues with the owners of the film. One of the only ways to see the full episode is on the “Mystery Science Theater 3000” 25th Anniversary DVD box set (available from Shout! Factory). UPDATE (April 8): Good news, fellow MSTies! Shout! Factory TV is currently streaming the MST3K version of “Gorgo” (episode #909) for free! A re-post (from “At The Matinee”). Cross-promotion was nothing new for the major studios and their motion picture newsreels. Up until the time of television (and prior to the 1948 “Paramount” anti-trust consent decree), the major studios usually had their newsreel units cover Hollywood or New York premieres of their parent studio’s motion pictures, or in the form of one-reel publicity short subjects. 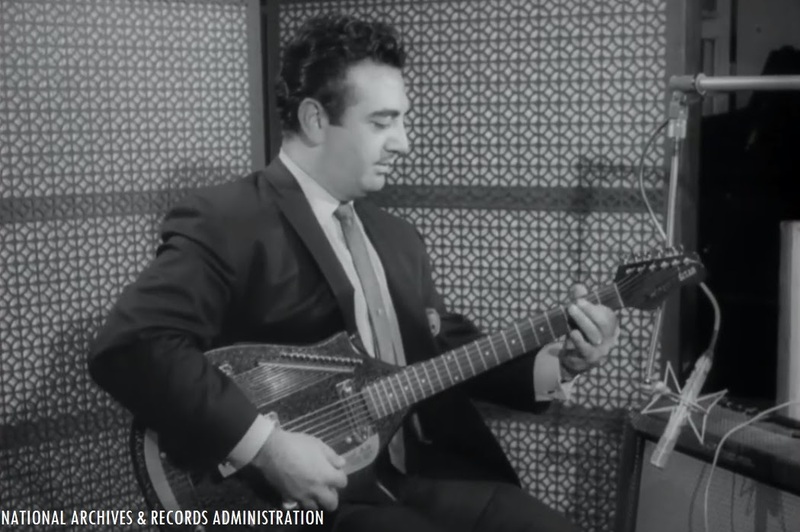 For the newsreel that was unearthed on the official YouTube channel of the National Archives and Records Administration, it not only shows one recording artist and his rendition of a popular song, but also showcasing a unique “electric” version of the sitar instrument. Vinnie Bell, then a recording artist for Decca, showcases his Coral Electric Sitar, in a piece for the September 9th, 1967 edition of Universal Studios’ Universal Newsreel. Eventually, this was a cross-promotion piece for parent company MCA, and its divisions (Universal, Decca and Coral/Danelectro). 1967: By this time, the motion picture newsreel was winding down in production, and there were only two newsreels in circulation: Universal Studios‘ “Universal Newsreel” and Hearst’s “News of the Day” (formerly known as “Hearst Metrotone News,” as it was released for theatrical exhibition by Metro-Goldwyn-Mayer). Ironically, Decca handled North American distribution rights of the original Kaempfert recording in 1962. What does this have to do with Cross-Promotion? In 1962, the Music Corporation of America (MCA), the leading talent agency and television syndication/production company (headed by Lew Wasserman), acquired American Decca Records. Along with Decca and its subsidiary labels, MCA also acquired Universal Pictures as part of the package (four years earlier, the company acquired the Universal Studios lot in Universal City, California- primarily for production of the company’s television shows). This did not sit well with the Justice Department, so to avoid any anti-trust concerns, MCA divested its talent business, and decided to focus on motion pictures, television production/syndication and recorded music. 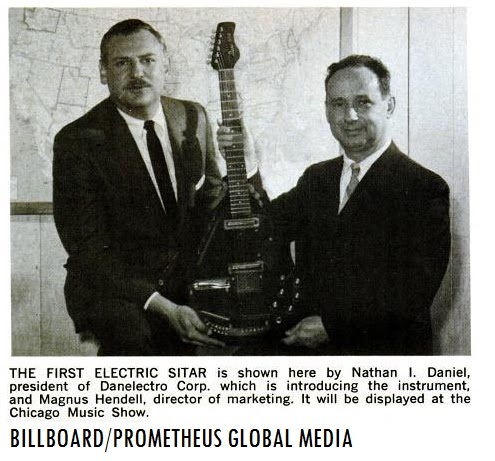 In 1966, the entertainment conglomerate decided to expand into the field of musical instruments, by acquiring the Danelectro Corporation, which was founded in 1947 by Nathan I. “Nat” Daniel (1912-1994). Danelectro was known for manufacturing electric guitars not only under their own name, but for catalog department stores including Sears, Roebuck & Company (under the “Silvertone” name) and Montgomery Ward (under the “Airline” name). According to the May 1967 press release in Billboard, the MCA subsidiary introduced the first electric sitar on the market, along with the research and development of both Vinnie Bell and and Nat Daniel. The instrument was introduced to the public at the Chicago Music Show that same year. When this instrument was put into production, the electric sitar did not bear the “Danelectro” name. It was made under the “Coral” name, as Coral was a former sister label to Decca, only re-purposed by MCA for the production of musical instruments during this time, to compliment the entertainment conglomerate’s music and home entertainment subsidiaries (including a line of “Decca Musical Instruments”). Yet, the relationship between MCA and Nat Daniel would not last long, as the entertainment conglomerate shuttered the musical instrument division, due in part to lackluster sales. At the end of 1967, Universal Studios decided to end their newsreel operation, while competitor Hearst decided to focus on their existing “Screen News Digest” series for exhibition in the classroom. This was interesting piece of cross-promotion between Universal’s then-parent firm (MCA), showcasing their recording artist (on Decca Records) with the latest innovation in the field of electric musical instruments (the Coral Electric Sitar) at the time. Questions? Comments? Drop a line at the comments section! Cover Art from Ken Burns’ Empire Of The Air. Credit: Antique Wireless Association (Artwork)/Florentine Films/Public Broadcasting Service. One of his documentaries, “Empire of the Air,” examines the pioneers of radio broadcasting (originally telecast in 1991). Narrated by Jason Robards (1922-2000), Ken Burns’ documentary showcases three iconic innovators – Lee DeForest, inventor of the audion vacuum tube; Edwin Howard Armstrong, inventor of the regenerative circuit, the superheterodyne radio receiver and “frequency modulation,” or FM radio broadcasting; and David Sarnoff, who created one of the biggest communications companies. Ken Burns’ “Empire of the Air” is an insightful documentary about the pioneers of broadcasting and communications. If you’ve never seen the film before, see it when you have the chance. It is available on DVD (also part of the “Ken Burns’ America” box set) and streaming through Amazon Instant.